We’ve published the BBC’s Annual Plan for the year ahead today. It sets out our interest in opening up BBC Sounds to others’ podcasts and commercial radio. I want to use this article to explain our thinking. British radio is the best in the world. That’s been built on the quality and range of our programmes, and the creativity of everyone who works in the industry. But there’s been another factor - we’ve always been in charge of how we reach listeners. We’ve built networks and we’ve built stations - so that everyone can get radio for free, at a high quality, with a raft of distinctive stations designed around the needs of British audiences. Global players are entering the industry like never before. Already Apple and Spotify account for over 80% of the music streaming and podcast markets in the UK. Choice and plurality are good. But dominance by one or two gatekeepers would not be. Colleagues from other industries often tell me they wish they had put more emphasis on building up their distribution channels rather than relying on social media. Many of them are addressing that through changes to their business models. To be clear, radio isn’t in that situation yet. Reach has been growing and only a small proportion of listening is online. However, we should heed the lessons of other industries and change before we have to. It’s vital we safeguard British radio for now and future generations, with a fully competitive market that involves investment and choice from UK providers as well as large global commercial players. With BBC Sounds, we are already offering an alternative audio destination to the global platforms. But for the last few months we have also been talking to colleagues in British radio to see if Sounds could help them. That’s why in the BBC’s Annual Plan we have confirmed we are in discussions with key UK stakeholders on how listeners could enjoy live linear radio and podcasts from third party providers in BBC Sounds. Our aim is to support the British creative industries, as well as champion new, niche, innovative UK podcasts that may struggle to achieve prominence on global platforms. We would like to make Sounds a platform that serves British audiences and British creativity. It’s early days yet with the discussions and nothing is confirmed, but as we have to mention our ambition in today’s plan, it felt like a good time to explain our thinking a little bit more. We’ll talk about what we hope to do in the months to come. In addition to Sounds, we want to continue to make our content available to third party platforms. But we want to do so in a way that ensures choice and competition. My colleague Kieran explained recently about the fact that our podcasts are no longer available on some Google products. Google search only links you to their own app for instant playback of podcasts - rather than giving people a range of options, including BBC Sounds, Apple and Acast. This limits choice. It’s one of the ways it falls short of our Distribution Policy. We’ve asked Google to stop favouring their own app from search, but were told this wasn’t possible, and instead that the only option was to take our podcasts off their service. This is disappointing, and as Kieran said, we are in discussions with Google to resolve the situation. BBC Sounds has had a great start. There have been more than 1.7m app downloads and 85% of Sounds users say they would recommend it to a friend. But - four and a half months in - it’s just the start. We’re adding functionality - this week we launched live restart in the app. You’ll never again miss that key bit of an interview or the start of a Radio 4 drama. The BBC has always been here to bring the best to everyone. That means reaching everyone - and we’re seeing some great signs here. A third of Sounds users weren’t previously using iPlayer Radio. BBC Sounds can serve existing listeners brilliantly but also make sure that future generations grow up loving radio as much as we do. 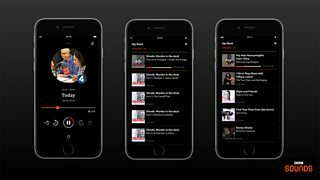 I couldn’t be more proud of the unique portfolio of stations we have across BBC Radio and I believe they all deserve a brilliant digital product which helps current and new listeners enjoy our programming. With so much competition for people’s time, and with big, mainly US commercial tech companies now dominating the audio market, I believe BBC Sounds is a crucial part of what we need to truly champion British audio, bringing the best of all UK audio to everyone.